Like a serial that never ends, it’s time for the next installment of dining on Buford Highway. For this episode, Jennifer and I find ourselves at Quan Ba 9, an oft overlooked storefront in a small strip mall. Never heard of Quan Ba 9? Frankly, if it hadn’t been for The Blissful Glutton neither would I. 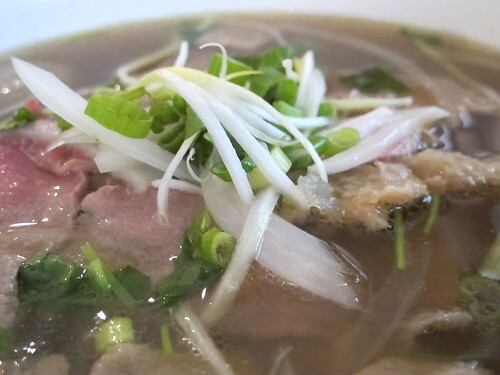 In one of her Ethnic City posts for Creative Loafing, Zyman extols the virtues of Quan Ba 9’s various salads, the pho, and the house specialty, Mi Quang Ba 9, a noodle soup with chicken broth. Having trust Zyman’s opinions for a number of years, it was all the reason I needed to drag Jennifer to this hole in the wall on Buford Highway. 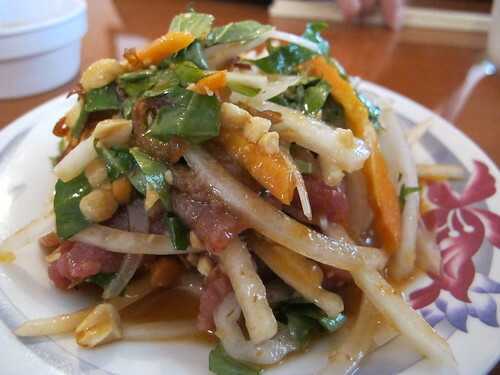 Taking another cue from Zyman, our first dish was an order of the beef carpaccio or Bo Tai Chanh. 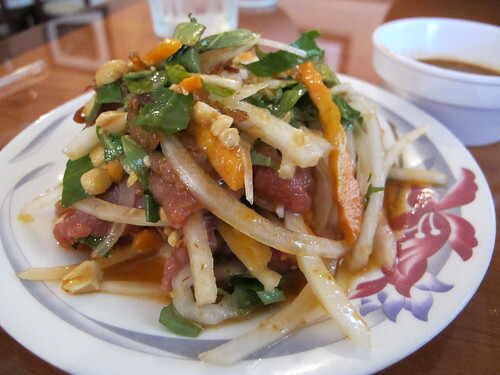 Here long strips of thinly sliced beef are coated in a sweet, spicy sauce that is punctuated with the crunch of carrots, onions, and lotus root. A precocious start to the meal, I only wish there was more beef to this beef carpaccio salad. 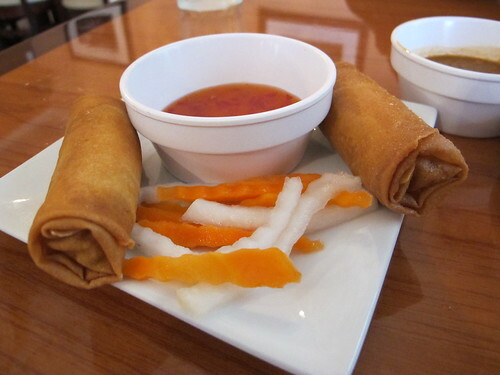 Having forgotten Zyman’s recommendation to skip the cha gio, an order of the fried springrolls were next to the table. The wrappers were thick and crispy but surprisingly not at all greasy. While the filling did bear a slight resemblance to minced hot dog and spam, what bothered me was the odd fermented smell. 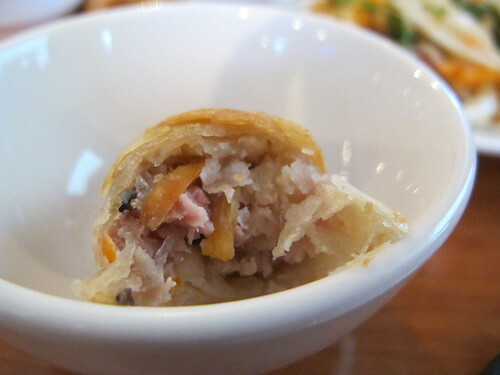 This wasn’t the pungent but pleasant smell of fish sauce or nuoc cham, this filling smelled rotten. 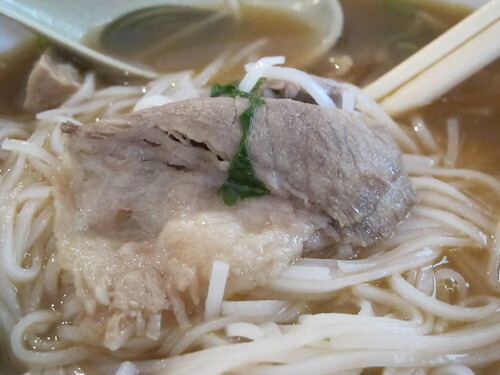 With pho on my mind, the heart of this meal was a bowl of pho dac biet. This pho had a rich broth with the distinct taste of onion and what I think was fried shallots. The brisket in this pho dac biet was thick, hand cut, and fatty while the meatballs were greasy but with a satisfying emulsified texture. Surprisingly, for a bowl of pho dac biet, the shredded tripe and soft tendon were nowhere to be found. Even with the missing offal, this was a decent bowl of pho. 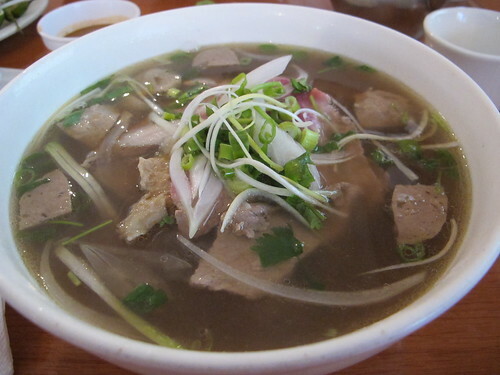 Another day, another satisfying bowl of pho, I can understand why Zyman is such a fan of Quan Ba 9. As always, I barely scratched the surface of the menu but outside of the cha gio, I was pleased with what we received. While I’ll sound like a broken record and say that Pho Dai Loi #2 is still my favorite pho in Atlanta, it’s nice to know that are still hole in the walls worth exploring.